As promised, I'm back to let you know how I got on with the 9 inch circular needles I took for a spin. I have a feeling that some of you won't be pleased with what I'm about to say ... so I'll not muck around. I'll just say it: I am not a fan of the teeny tiny sock needles. You can see I persevered with them for quite a while because the leg of my sock is nearly done. I really did try to like them. After all, so many people do. But I just couldn't. With every single stitch I yearned for different needles. Casting on was ok, I've told you about that. Next, I was straight into the ribbing and in the beginning I was all thumbs. It took quite a few rounds to figure out how best to hold the needles. I usually knit ribbing by knitting in the western method and purling in the eastern method. 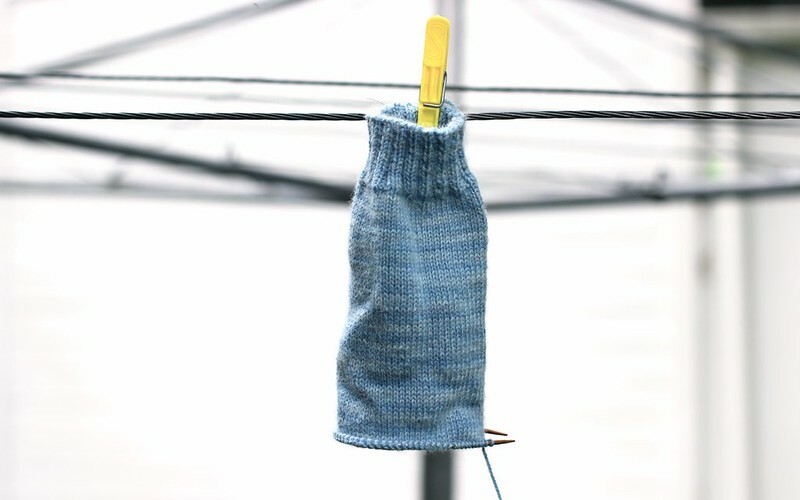 It's a great way to keep ribbing lovely and neat and if you're not sure what I'm talking about, I explained it once upon a time in another blog post. Anyway, after a while I did get to grips with the short tips and did manage my usual ribbing but as I was working I imagined that it might be easier to knit Continential style, with the working yarn in my left hand, rather than the English style I'm used to. Maybe you could let me know if you like these needles and if so, whether you knit continental style? I did try but really, it was no better because continental knitting is so unfamiliar to me too! Then, as I knitted I noticed I was rubbing the edge of my finger on my right hand in the same place over and over. Ouch. I guess over time that'd pass but it was quite off-putting. My biggest disappointment came when I finished the ribbing and moved on to the sock leg. I'd been hoping to knit a sock with a lace insert down the front and I did try a few rows but I found it so awkward and difficult to manage anything other than straightforward knit stitches I gave up, ripped back and started again with a vanilla leg. Not so pretty. I do have to say, it was fast knitting once I'd mastered a reasonable technique. There's no yanking stitches around a cable, no moving from needle to needle. Just knit, knit, knit. My little sock grew like the wind. But, and this is a big BUT, I really didn't find it relaxing and I found myself avoiding knitting and feeling quite negative about sitting down and knitting. Oh no! It was horrible. I wondered what exactly it was that was putting me off so much? I'm open to new things so I didn't think it was that. I managed to get a reasonable technique sorted and although I wasn't thrilled about knitting a vanilla sock I wasn't that upset about it. My finger grazing did get better and hey, it was pretty quick going. I decided in the end that it was the tiny range of movement that I really didn't like. I found that all movement was concentrated in just a few fingers and those movements are really tiny. 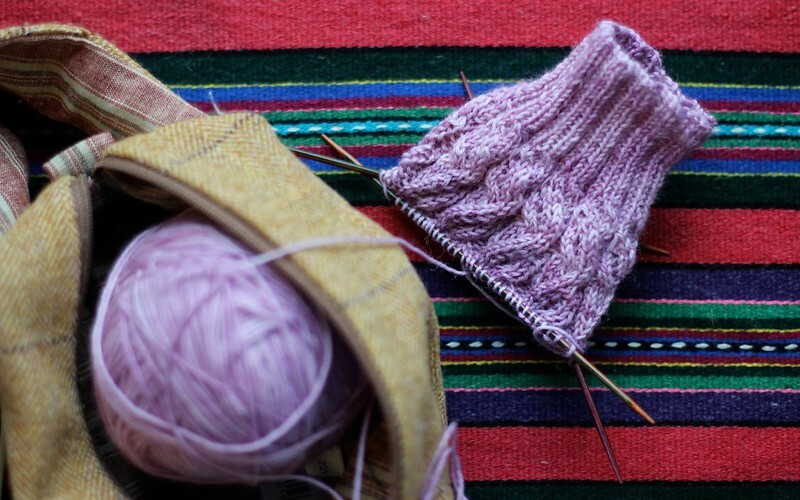 Knitting with just the ends of my fingers made me tense and tight. My hands stiffened, my shoulders crunched up, my neck became rigid and I clenched my jaw. It made me feel exactly the opposite of how knitting usually makes me feel. Soft, relaxed and calm. It's hard to imagine that there's much movement in knitting but I guess for me, my usual style with longer tips uses more of my hands and wrists than I'd realised. I know a lot of you just love these tiny needles - did it take you a long time to get used to them or was it love at first round? For those of you who haven't tried them - maybe try to borrow some before you buy your own? Have a think about your knitting style, are you a big movement knitter? 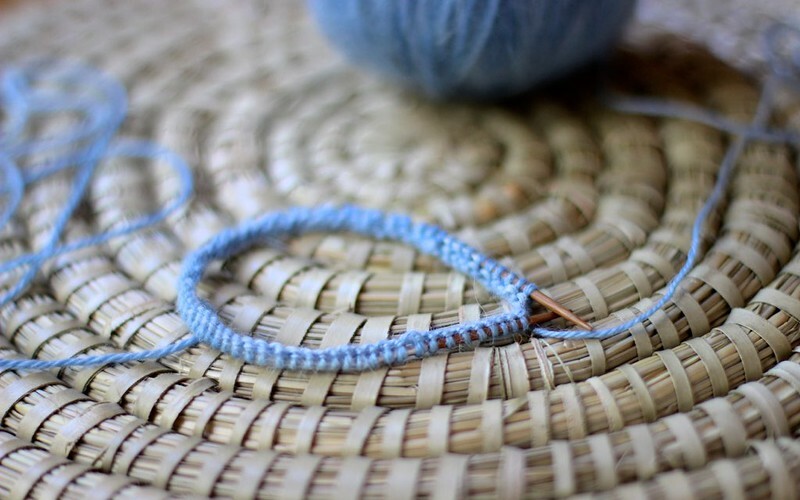 Have a go at holding your needles right at the very tip, maybe an inch from the end - how does that feel? Tight? Odd? Just fine? So, over to you. What do you think of 9 inch circular needles? Have you tried them? Want to? Love them? Hate them? Any tips you might have for someone wanting to have a go? I have been curious to try a tiny short sock circular needle since I first heard of them - maybe last year? These miniature circular needles are about nine inches long from needle tip to needle tip and come with a choice of steel or bamboo tips that are a teeny weeny two inches long. When you join the ends of your knitting in a circle they are the perfect length for socks (I can also imagine a little sleeve might work well too). Opinion seems to be divided about them with some loving them and others really not and I was keen to take some for a whirl. So, when a friend suggested I try hers, I jumped at the chance. I borrowed her Hiya Hiya nine inch US1/2.25mm bamboo needles. They look very cute and happily the size is stamped into the wood rather than printed on, so it shouldn't disappear with use. The needles are like thickened matchsticks and the ends taper to a nice sharp point but don't seem so sharp as to poke a hole in my finger. I do like the joins. The needle tips are fixed to the cable and the joins are lovely and smooth. So, with a mixture of trepidation and excitement, off I went. I hit my first hurdle casting on. My go-to cast-on is a cable cast-on so I gave that a go. Hopeless! I absolutely could not coordinate myself to manage that cast-on with such tiny needles and after trying to get even stitches and fumbling and failing, I gave up. As far as I can work out the best cast-ons for these little needles are ones that involve one needle - backwards loop and long tail. In the end it was long tail that won the day but look at the length of my tail?! looooooong. One day I'll figure that out. Joining in the round was a breeze and I doubt there's much risk of twisting your stitches because it's so easy to see if they're straight. I cast on an extra stitch and joined by knitting my first and last stitches together. We'll see how the rest goes. I'm using some very lovely sock yarn dyed by a local New Zealand dyer Happy Go Knitty - I thought it was the same base as I used for my striped socks earlier in the year (alpaca/merino/nylon) but since I've put the tag in a safe place that now eludes me ... I'm not sure. Maybe it's her BFL sock?! Who knows. It's gloriously soft either way! I'm not quite sure what to think about my mis-matched pair of socks. I didn't expect them to be quite so different and while a part of me doesn't mind, after all they're beautifully soft, a bit off the wall and certainly colourful, there's another part of me that's squirming. For those that have used it before, is Casbah always this random?! Having said that, I don't know which is of the two I prefer - left with it's lovely pinks and slimmer stripes or right with it's wider stripes and tons of white? My socks are knit top down with a 1 X 1 rib cuff and 3 X 1 rib legs. The heels are traditional heel flaps where I slip my stitches knit-wise so that I get a nice twisted heel. 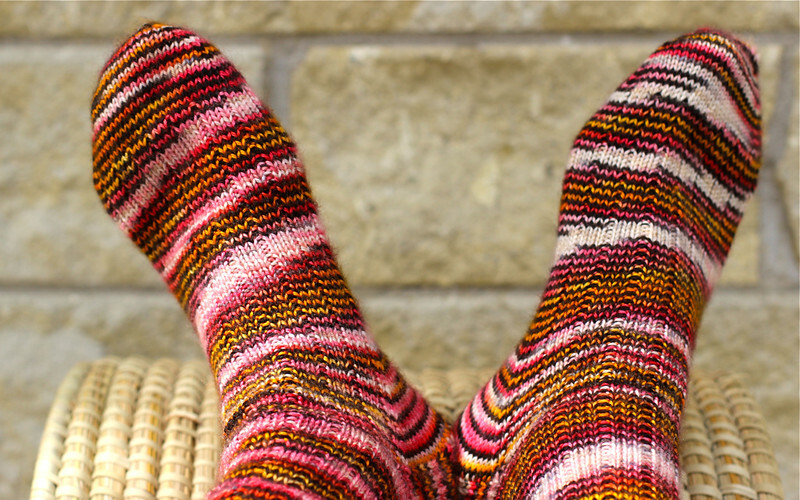 I probably should have put in an afterthought heel so that the stripes didn't get all muddled across the top of my ankle at that point but hey, I think this confused pair of socks probably doesn't mind. The 3 X 1 rib continues down the top of my foot with straight stocking stitch underneath and my toes are simple round toes decreased on each side every second row until 12 stitches remain on each side. This pattern by Glenna C. is a goodie to follow if you want to make something similar. My Ravelry page for my socks is here. It's been far too quiet on this blog. Truth be told, I've been feeling stressed, wound up and a bit down and although I have a tendency to go a bit quiet when I'm like that - it's probably the worst thing I could do. I love people, love chatting, both in real life and here on my wee blog and when I'm not blogging I really miss the company, the stimulation and the satisfying feeling of making art by taking photos and writing about what I'm up to. So, I'm going to make a real effort to get back into the groove of blogging. I need it. Plus, I've accumulated a backlog of things to show you! Shall we start with socks? I showed you my puffin yarn, a scrummy blend of merino, cashmere and a smidge of nylon ... well, this is how it's knitting up. I'm knitting a three by one rib - three knit stitches and one purl stitch - but you can't really tell in the picture. I was promised that I would constantly stop and caress this yarn and it's true, I am. I'm even pushing it towards anyone near me and instructing them to feel it too. The cashmere is divine and my knitting feels fantastically soft and silky. Aren't the colours crazy? I'm totally entertained by the way it's knitting up and keep imagining how it might be slightly or even drastically different if I was knitting larger or smaller socks. I'm getting a spiral effect with the stripes with the 64 stitches I've cast on for my feet. I'm guessing that the stripes would be straighter with more stitches and probably even more curly wurly with less. I'm still a fan of my double pointed needles for socks, especially my pretty KnitPro rosewood needles. It's a pain in the neck when you drop one in the car and it slides down between the seats but I do love how they look and how they feel. 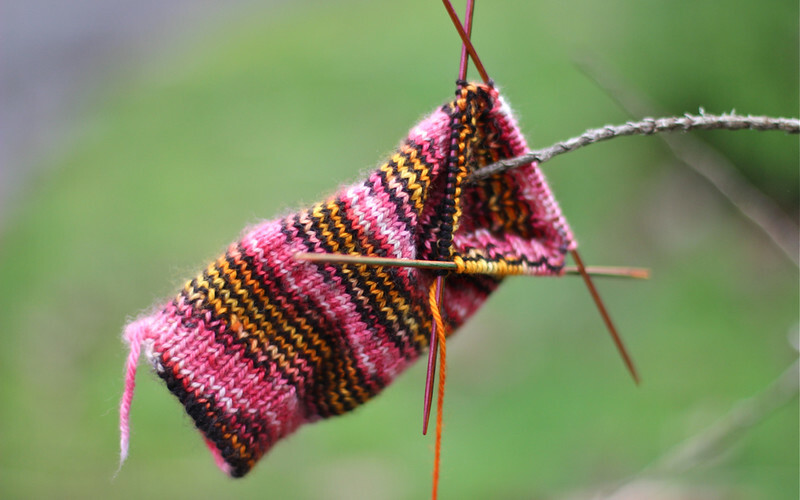 I've had a few questions lately about how to fix the "ladders" that you can get between the needles when you're first learning to knit socks. I used to get those too. Initially I gave my first couple of stitches a good tug when starting on a new needle but eventually I think they just vanished with practice. Knitting is all about practice. Stick at it and do it regularly and everything will be alright. I'm sure it's true of blogging about knitting too. To be honest, the rate of knitting and generally making has gone downhill here at Truly Myrtle. I have been pulling out my knitting but it's not growing too much - just a row or two here and there. This past couple of weeks has presented a few challenges that really needed me to be knitting something super simple. Instead of these very pretty pink socks with some of my newly hand-dyed yarn, I should have cast on a straightforward stockinette pair of socks, so I could knit and chat, or zone out a bit to the click clack of my needles. I've had poorly kids around and managed to get a bit of their bug myself but mostly, my Dad hasn't been well. Sadly, after an initial stay in hospital and a few tests, we've just found out he has cancer. There will be more tests to figure out if it's spread and we're all feeling a bit shaken. I'm not good at getting much done when I'm worried, especially things that require me to count, think, be very careful or follow a pattern. And since everything already on my needles includes lace or cables or both, I definitely need to start something new. So what to cast on? 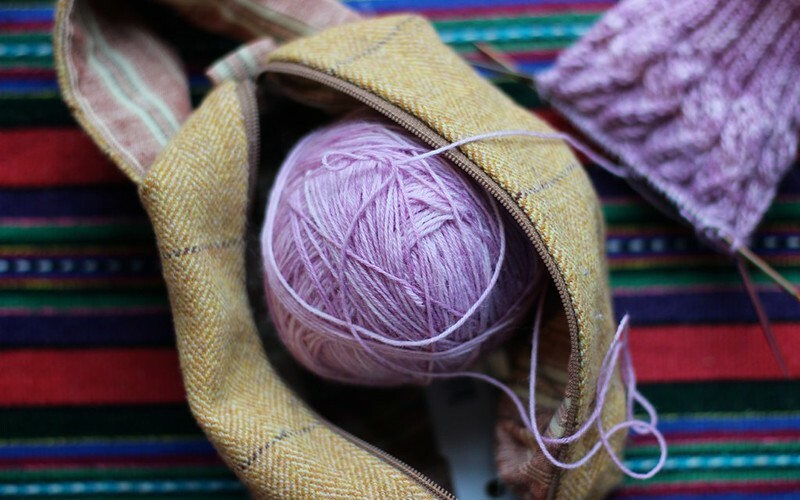 My new project has to be super simple, soft, warm and very lovely. With that in mind, I'm off to have a rummage in my stash for some sock yarn that'll make truly lovely vanilla socks.